An oral cancer screening combines both a visual examination and physical examination of the mouth and surrounding tissues. It can provide peace of mind to patients who are concerned, or it can ensure that early treatment is started if a problem is found. 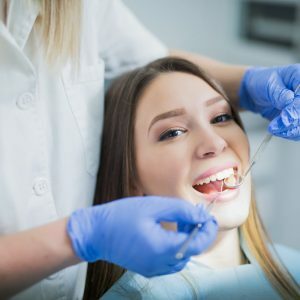 There are many reasons why a cancer screening would be completed, including certain lifestyle choices that put the patient at risk for developing oral cancer. The goal of oral cancer screenings is to catch any problem before symptoms show, which can greatly improve the prognosis. Let’s take a closer look at how each part of the examination is performed. While the entire oral cavity and the tissues around it are examined for any changes, the primary focus is on the face, lips, inside of the nose, and the neck. Your dentist will look for anything that looks abnormal, like patches of skin that are a different color, swelling, ulcers, or any asymmetrical area. They will use different tools to allow full visibility of hard to see areas. Part of the examination for oral cancer is the physical exam. Your dentist will feel your head, cheeks, jaw, and other parts of the oral cavity to ensure there is nothing in the tissue that shouldn’t be. For the most part, they are looking for masses or nodules that can be felt in the tissues of these areas. After your screening, your dentist will recommend that you return at regular intervals to ensure that you remain free of anything that concerns them. 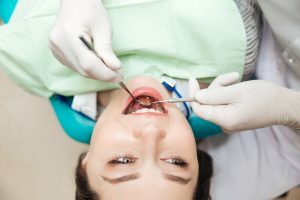 If there is something they are not sure of, or they feel or notice something that needs further investigation, your dentist will refer you for further testing to determine whether there is a true concern and if there is, you will be referred for treatment.